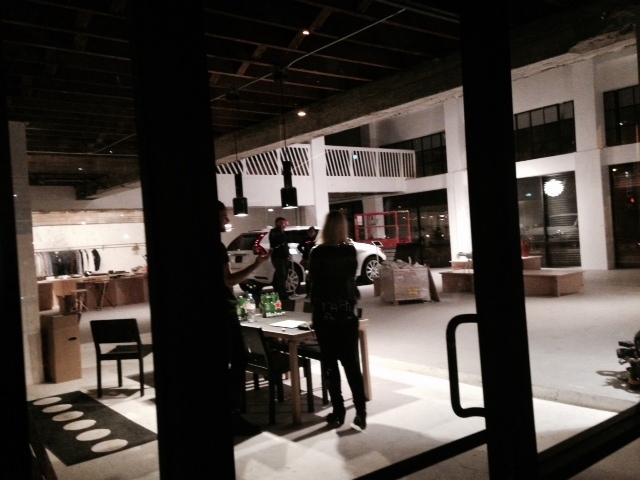 If you wandered past 9th & Hill on Saturday night this is what you would have seen: people working late unpacking boxes–one labeled “bicycle,” others of mysterious sizes scattered across the concrete floor. 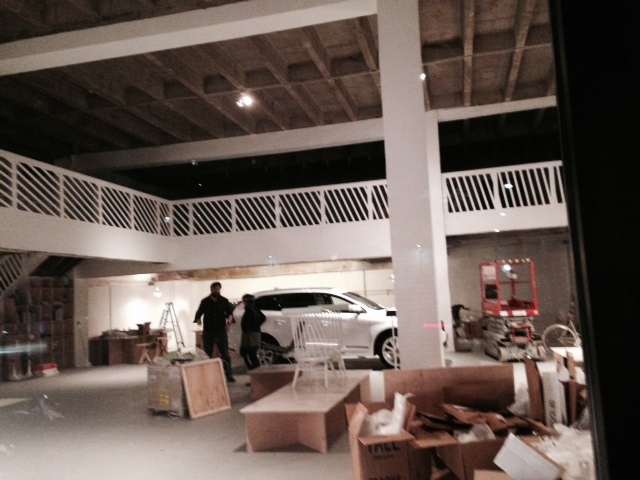 There was a single, white, wooden chair on a plywood pedestal and, in the background, a brand new white Volvo SUV. If you walked past the same location on Sunday afternoon, a team was deep in conference at a long table with two small black dogs at their feet. Most of the boxes were unpacked and the windows were dressed with an even more random, yet increasingly intriguing, assortment of items. 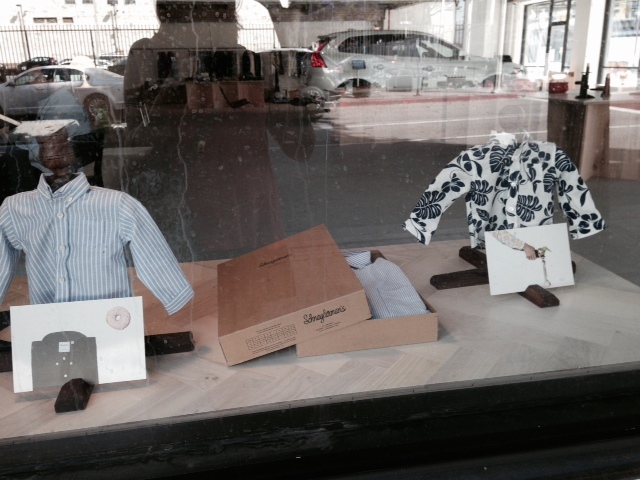 There were children’s tailored shirts and a men’s shirt winking from a craft-brown box with “Schnayderman’s” scripted as the label. Really? A shirt in it’s very own box? And what about those snow white chairs and the orange-handled branch pruners laying on display? Is it a prop shop? Is it a museum? Apparently it’s the latest iteration from Carlström & Company|C&CO, described on their website as a growth consultancy and business incubator headquartered in New York. The website describes C&CO’s services as “Bridging the gap between a management consultancy and an advertising agency.” Clients listed include Absolut Vodka, Jameson Irish Whiskey, Estee’ Lauder and The Museum of Modern Art (MoMA) as well as advertising agencies. What they appear to be doing in this space is fulfilling their plans of establishing a Nordic design and innovation showroom in Downtown Los Angeles. I love these guys! In C&CO’s other role, as stated on their website, they function as an incubator and invest time and/or capital in new ventures, of which Schnayderman’s Shirtmakers is one–having brought the brand from Scandinavia to the U.S. in the fall of 2013. According to C&CO’s website, the company’s founder, Fredrik Carlström, is a marketing veteran with almost two decades of experience advising companies including IKEA, H&M, Electrolux, and L’Oréal, to name a few. Carlström was the CEO & Executive Creative Director of the U.S. operations for the digital agency, Great Works, which was named by AdWeek as the 2010 Agency of the Year. 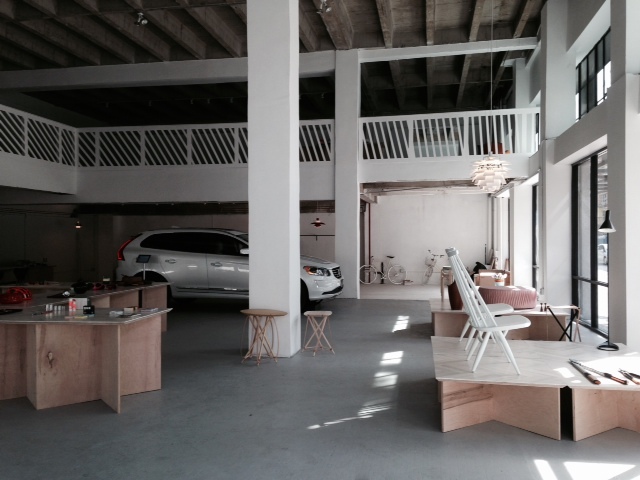 Looks like this creative space is C&CO’s new base for helping Scandinavian companies get established and grow their presence in the U.S. Hence the orange-handled reminder of what the Swedes have made a household requirement: If it’s a scissors (or rose pruner…when I had roses to prune) it’s got to be Fiskars! With Stockholm-based Acne Studios and il Caffé just a block away, and H & M soon to open at Fig & 7th, we might call it the Swedish Awakening in L.A. And just think about it, not only is DTLA one of the most creative emerging urban locales, we also get 8-9 hours of nighttime 365 days a year… and no snow! Now there’s another good reason to choose our city as the perfect place to innovate and incubate! And since I’m pretty sure Camilla and Anna, our Swedish au pairs whom we haven’t seen in nearly 19 and 18 years respectively, are probably reading this–it’s time for you both to come back for a visit– you can actually have a really great time in downtown now!